This post is sponsored by Villeroy & Boch. Happy Friday, everyone! I've been fighting a cold all week. Just when I thought I was in the clear, it got worse. But I'm on the mend and am definitely trying to catch up on work and am so ready to relax this weekend. It's supposed to snow tomorrow in the city and you know I'll definitely be taking advantage of that for a photo shoot! (Bearing in mind I'll more than likely freeze my booty off ha ha!) I know my pup will be over the moon about the snow. But what to drink afterward? I'd suggest either a warm Hot Toddy OR perhaps something a bit more festive and fruity without burning your tongue off? 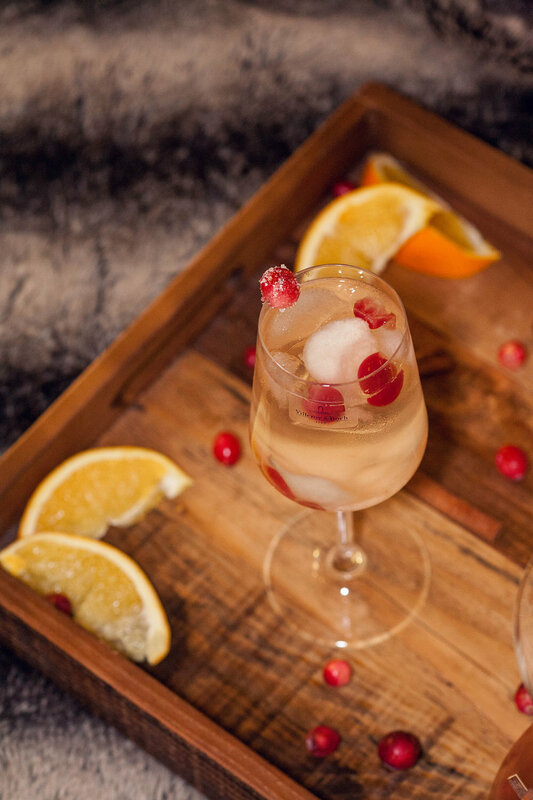 I've partnered with Villeroy & Boch to share my cranberry Asian pear Christmas Sangria recipe! It's so delicious and easy to make, you're not going to want to miss out on this amazing concoction. Continue reading for the recipe, it'll be a weekend hit! In a small saucepan, over high heat, combine water, sugar, cinnamon stick and 1/2 C. of the cranberries. Once boiling, reduce to low heat and simmer for about 5 to 8 minutes, until the cranberries have begun to pop a bit. Remove pan from the heat and allow to cool to room temperature. 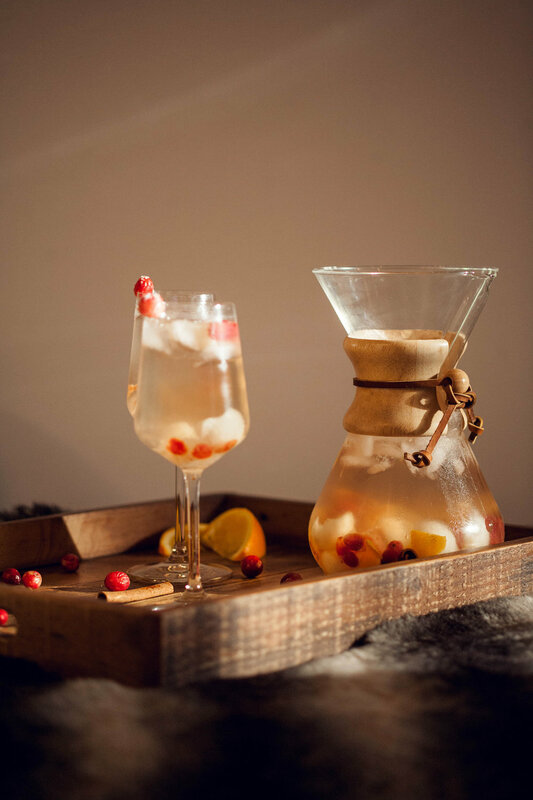 In a clear glass pitcher, combine the Brandy, pear, remaining cranberries, orange zest and the cooled sugar mixer including the cinnamon sticks with the wine. Refrigerate and allow the flavors to come together for 12 and up to 24 hours. When serving, spoon some fruit into a glass, pour the sangria over the fruit and top with a splash of sparkling water. Try topping the glass off with a sugared cranberry. Just rinse some cranberries under water. Let them sit for second, then dip them individually into granulated sugar. There's not much to this recipe. 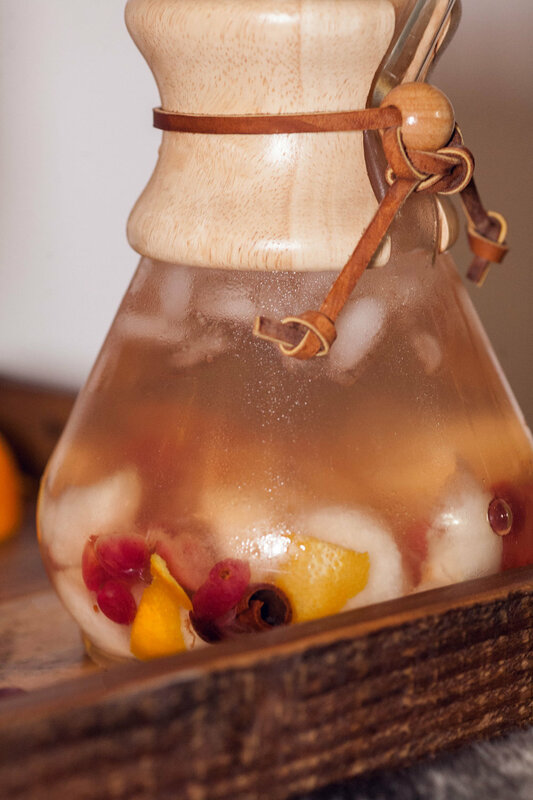 You'll need cranberries, an Asian pear, an orange, brandy, white wine, a couple of cinnamon sticks and sparkling water. Oh, and sugar for garnish. You don't have to but I found the added touch of sparkle on the cranberry polished the overall look right up. First, In a small saucepan, over high heat, combine water, sugar, cinnamon stick and 1/2 C. of the cranberries. Once boiling, reduce to low heat and simmer for about 5 to 8 minutes, until the cranberries have begun to pop a bit. Remove pan from the heat and allow to cool to room temperature. 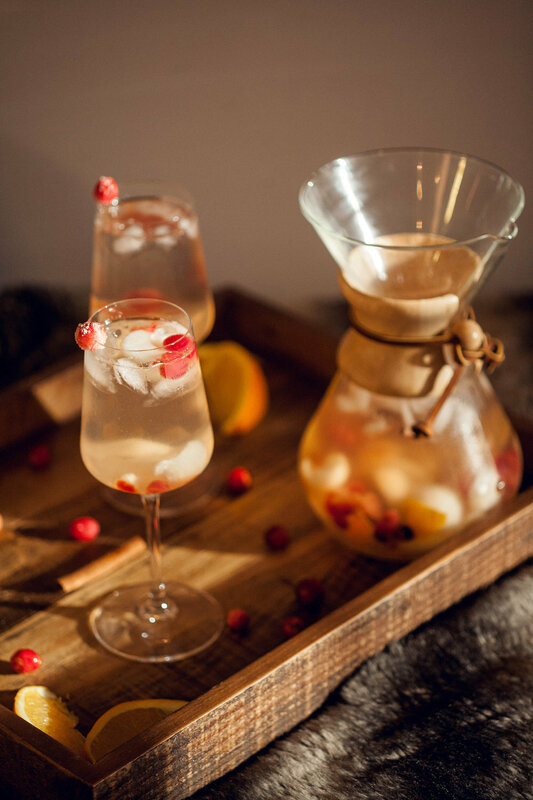 In a clear glass pitcher, combine the brandy, pear, remaining cranberries, orange zest and the cooled sugar mixer including the cinnamon sticks with the wine. Refrigerate between 12-24 hours, depending on how patient you are... but the longer you wait the more you'll allow the flavors to come together. I'd even recommend adding a dash of vanilla into the mix, if you like your sangria more on the sweeter side.